overall, a good stay...would recommend to others. Staff was very friendly and eager to please. Great hotel! Friendly staff! Rooms were nice and a good size. 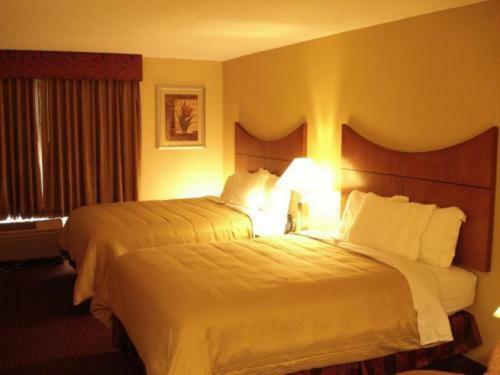 Loved the down comforters on the bed and that the beds were queen size instead of doubles! There was a great breakfast, sure to please everyone. Great size beds, down comforters. Very clean, great breakfast. We spent four days here. We were in town for Wrestle mania and chose this hotel because it was close to Universal. Rooms are clean. Beds are super comfy. Staff goes out of their way to make your stay pleasant. Universal is just literally 4 minutes away and it also provides easy access other attractions. There is an IHOP in the connecting parking lot if the continental breakfast isn't your thing. My kids loved the pool and the hot tub area. Overall we had a great experience and plan to return to stay next time we come to Universal/Orlando. Staff went out of their way to welcome us. No restaurant in the hotel. 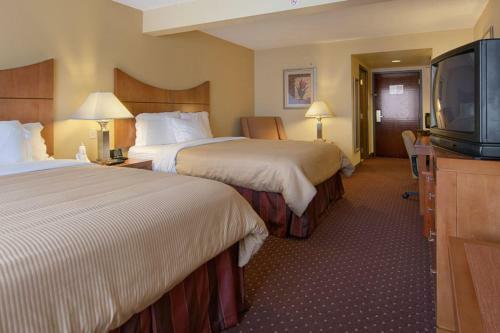 An excellent small hotel (100 rooms) for business travelers, the four-story Wingate by Wyndham - Universal Studios and Convention Center offers clean and cheerful rooms with plenty of work space and fast Internet connection. The staff is friendly and anxious to help, and the deluxe Continental breakfast in the off-lobby dining area will start a guest's day on a pleasant note. Close to Interstate-4 and connecting highways, major theme parks and the Convention Center are a short drive away. International Drive, with restaurants, shopping and attractions is also nearby. A fitness center and indoor spa makes staying here a good choice, especially after a hectic day. 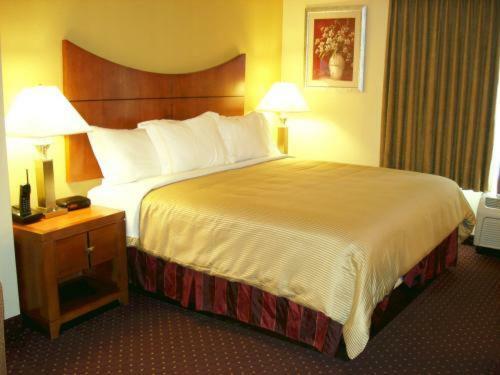 Although the guest rooms are standard in size, they dont lack in comfort or amenities. For those who have work to do, all have complimentary wireless Internet access, desk and lounge chair, coffee maker, mini refrigerator, microwave, in-room safe and free local calls. The small but adequate business center offers computers with Internet access, printer, fax and copying services. Meeting rooms will accommodate up to 60 people. Other amenities include a deluxe Continental breakfast (from 6am-10am) with hot and cold items, laundry facilities, an outdoor swimming pool, fitness center, whirlpool, and shuttle service to and from the Orlando International Airport, or to Universal Studios (only a 25-minute walk on a nice day). This is an above-average economy class hotel that will appeal to business travelers and families on a budget who want to get more for their dollar. Attractive and clean with comfortable accommodations, numerous fine amenities and recreational facilities, its central location offers easy access to major highways to explore Orlando. Its a good value and guests will not be disappointed.